TheRustedChain - The Blog: Summer Resolutions. I figured out long ago that I stink at New Year's Resolutions. Those extra pounds don't just go away because I will them to on January 1. So instead I make Summer Resolutions. And it works great for me! 1. Hang the laundry on the line. Only turn on the dryer if it's a rainy day. It's better for the budget, better for the environment, and actually burns a few more calories. 2. Only eat out once a week. This is a tough one. When the kids are around I tend to just go grab fast food or a pizza because it's quick and easy. But this summer, only one time a week will that happen. 3. Be firm with Unplug It Day. I really don't like this day. It's a huge struggle! But it's so good for us. 4. 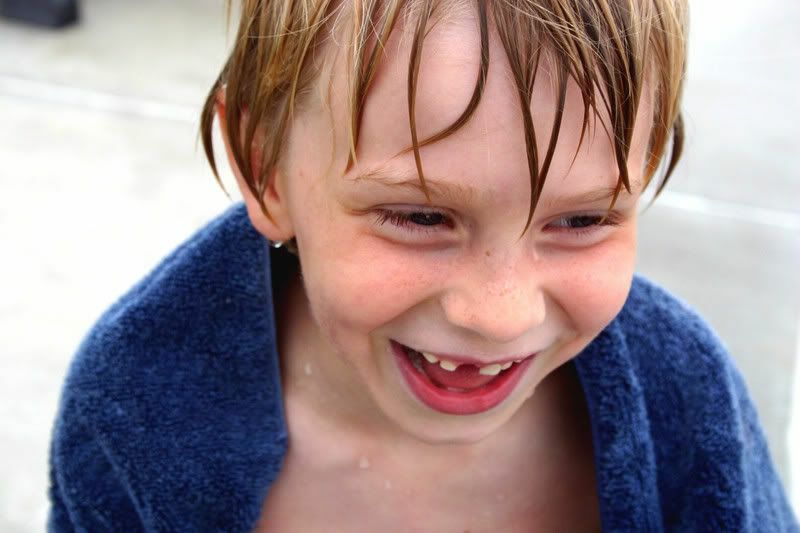 Take the kids to the library, lake, or water park at least once a week. 6. Take more Saturday mornings to myself to hit the flea market, yardsales, thrift stores, and farmer's market. Stop over to the Hooked On party and the Beautiful Life party! Love it!! I may have to follow your lead/example!! Hope you have a great summer with the kiddos!! I feel like I want to make each of your resolutions, MY resolutions! You can do it! Good stuff Bek-hope you can follow it! Mine is getting up at 5 or 6 am to walk. So far done it 2 days-woo hoo! Gotta shed those pounds! Great idea. Bit I had to laugh. I have those same shoes! I love them. I love hanging clothes on the line! Love this post!!!! I don't get to stay home - but I'm definitely going to adopt at lease some of these for my summer resolutions too! wow school's out already? I really should make myself some resolutions. Like loose weight and take time for myself. Love line dried clothing, missing front teeth, Sonic drinks, Country Home and Country Living, and words written in the sand. Love your resolutions and #6 makes me positively YEARN for us to be neighbors!!!!!!!!!!!!! Count on me to hold you accountable, sister. I'll be checking in unnanounced, k? I can't believe it's officially your summer - we still have the heating on!! Brrrr. Look forward to seeing what you get up to! holy crap, kids home already!?????????????????? cant wait to h ear if you stick to these resolutions...they are good ones. Me? I will just try to not go completely insane. Love your summer resolutions. I need to make a few of my own, too. Our kids are in school for another month (thank goodness). Great resolutions! I love it! I'll have to come up with some too. Good ideas! My hubby and two sons just got my clothesline poles put up last night. Can't wait to start using them. I hadn't even thought of the "burning a few extra calories" benefit. Maybe I should do a squat with each item I hang up for even more benefit! This really is a great idea. Very inspirational. I'm kind of doing the same thing.. not because it's summer but because we just moved. I like the idea of summer resolutions though! Wow! Early summer! Here in Japan almost everyone hangs their clothes, we don't.... we use the tiny dryer- I hang a few things like jeans and my dresses but almost everything else goes straight into the dryer :) Good luck with your summer resolutions! Good for you! I am so non-committal! I like your ideas, though. wow! 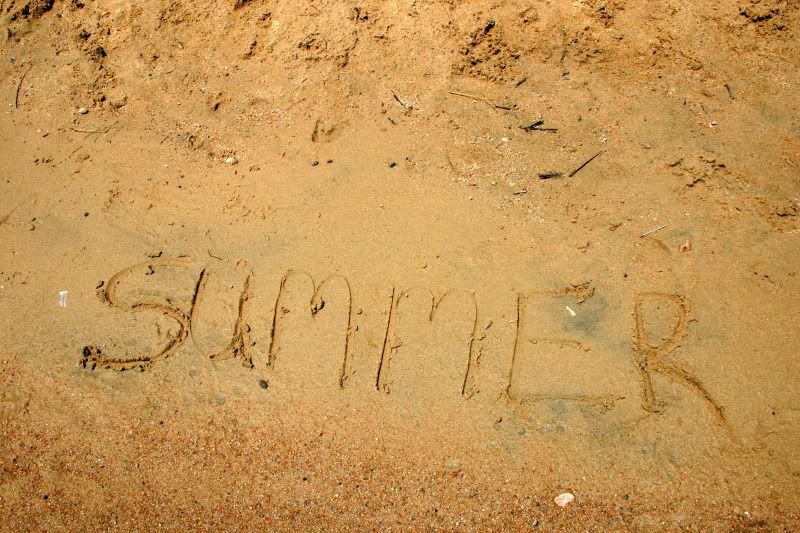 your summer begins early! good luck with your resolutions. summer is brief but not as brief as childhood when you look back. you'll be very happy to have the memories a summer like this will leave behind ;-) have lots of fun! Ok...I an officially passing my Mother of the Year award to you. You are way more deserving! Yeah! Now that's the ticket for a fun summer! This is a great idea! My husband and I have been talking about a clothes line for a couple of months now. I'll have to get busy making my resolutions! Love hanging out the laundry! I use a rack... I would like to get a line for the yard, though! Love your summer resolutions! Sounds like a great list you have there. Happy weekend! 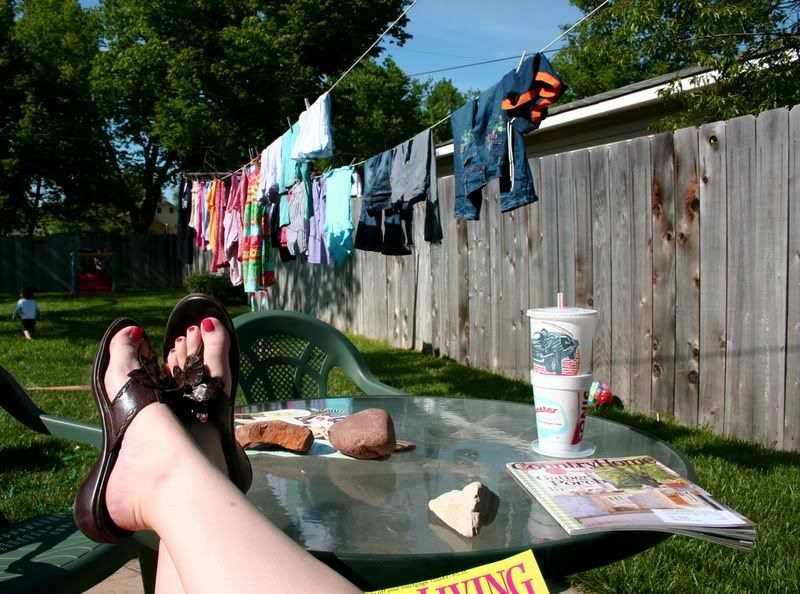 Love the backyard/laundry/feet propped up pic! Where'd you get those flip flops? this is such a great idea! I love your resolutions! Craft days!! :) I tried it two years ago and my kids loved it-I was so stressed I took last summer off:) I'll try again this year. Love the list -- but the clothes line won't work (too many trees and it's way too shady and my HOA won't allow it) Now isn't life grand with all these silly rules created by neat freaks who like to serve on board thatcan't stand a few sheets blowing in the wind. Thankfuly life is good and I don't give a flip. Love your list and must agree that Summer resolutions make much more sense than New Year's! It is just way too easy to procrastinate in the winter!